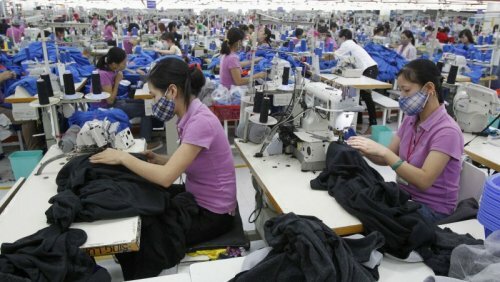 In some situations – notably Vietnam’s textiles, clothing, leather and footwear sector – most experts agree that the country will benefit from the creation of thousands of good paying middle income jobs. There can be little doubt that increasing middle income jobs will increase the standard of living for these workers and their families, grow their savings in the banking system, thereby restoring its liquidity. This liquidity can then be used to resolve the nation’s bad debt problem and allow banks to make loans to local businesses in other sectors, permitting them to retool, modernize and build their competitiveness. However, others point out that many Vietnamese contractors in the textiles, clothing, leather and footwear sector will most likely be left out in the cold when it comes to benefitting from tariff reductions set out in the TPP. Stanley Szeto, the chief executive of Lever Style, a Hong Kong-based firm that manufactures shirts and pants for brands from Hugo Boss to J Crew, is one of those who say they are not very excited about the TPP. “Although the TPP is expected to eliminate tariffs between member countries on items such as clothing, many contract manufacturers in Vietnam, are likely to see little of those savings if the pact goes through,” said Mr Szeto. Mr Szeto told a Wall Street Journal reporter recently that the reason is generally, global brands – not manufacturers – pay the cost of import duties under the contract arrangement where responsibility for the goods passes to the buyer once the products are shipped. Technically it’s called FOB (free on board) shipping point, which means in the case Mr Szeto is referring to that the brand takes title to the goods in Vietnam and is therefore responsible for all costs of transportation and risk of loss for the goods from the delivery point forward. Therefore, the brand is considered the importer into the foreign country and – no tariff reductions – are available under the TPP, said Mr Szeto. This would require manufacturers to renegotiate their contracts with brands for FOB destination contracts, which may be impossible or impractical in many cases, driving the cost of imports from these Vietnamese contractors substantially higher. Notably these Vietnamese contractors, under any scenario, would as a result be less price competitive with their foreign invested counterparts in the sector operating in the Southeast Asian country. In addition, Mr Szeto emphasized the TPP would most likely drive up labour procurement costs in Vietnam because competition for labour would be more competitive. He also said “Costs will go up and it’ll be harder for everybody to get capacity” at factories, referring to the fact that manufacturing capacity in Vietnam would be limited and therefore bump up costs. Adam Sitkoff, executive director of the American Chamber of Commerce in Hanoi, a membership group for representing US companies argues that despite the higher costs, Vietnamese contractors would still benefit. “Since global brands will be sourcing increased volume of product from Vietnam,” Mr Sitkoff argued they would still likely choose to source more from Vietnamese contractors and absorb the extra cost. There is also widespread agreement that Vietnamese consumers will benefit from the trade accord by being able to buy a wider variety of foreign goods at lower prices, which in and of itself raises real wages and helps families purchase more with their current incomes. Beyond that, there is very little agreement between the experts, on who actually benefits from the agreement and the debate doesn’t appear likely to be resolved anytime soon. The TPP involves Brunei, Chile, New Zealand, Singapore, Canada, Japan, Malaysia, Mexico, Peru, the US, Vietnam and Australia.